We are all aware that different genotypes (varieties, cultivars) within a crop species can react very differently to pathogens and pathogen-vectors. This allows the selection and development of disease-resistant crop varieties. We should also understand that the same crop genotype, i.e. a single variety or cultivar, can produce very different reactions to a specific pathogen even at one location in response to local variation in environmental factors. The occurrence and implications of crop-pathogen-environment interactions need to be understood, considered and managed in research on crop improvement and agricultural intensification. a) At IITA in south-western Nigeria a single improved rice variety grown in a toposequence trial from a valley bottom up a slope for a 100 m had no leaf blast in the valley bottom but had increasing levels of leaf blast up the slope, so that the plants at the top of the slope were severely damaged by the disease (Figs 1 - 4). Fig 1: View from the top of the slope. 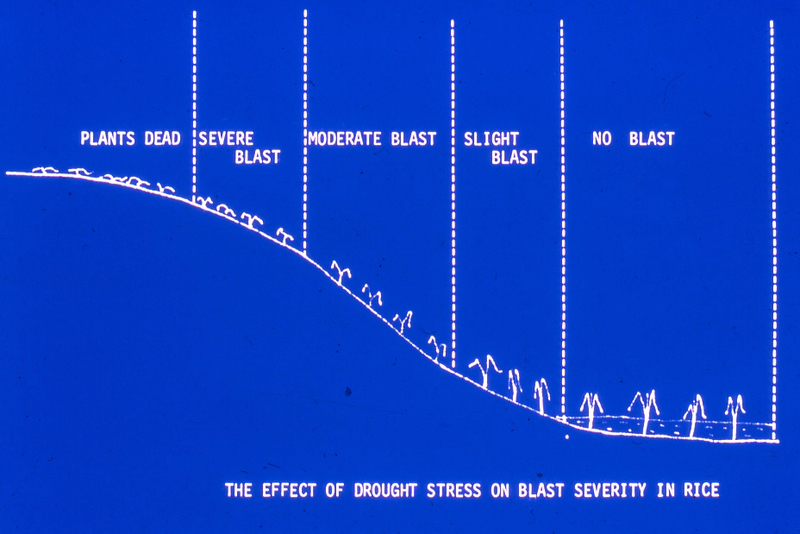 In a single rice variety, leaf blast is severe at the top of the slope but there is no leaf blast at the bottom of the slope where the plants are not drought stressed. Fig. 3 View from the bottom of the slope. 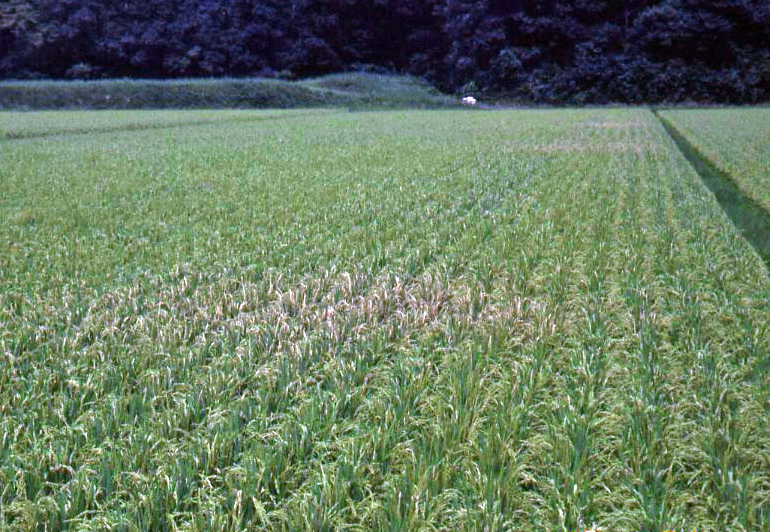 Rice plants at the bottom of the hill are blast free, whereas those toward the top (brown coloration) have severe leaf blast. 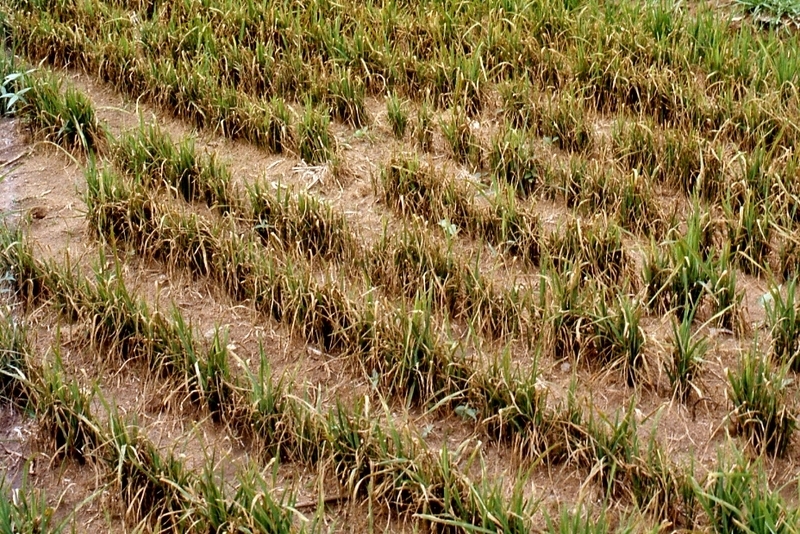 In this trial, a single improved rice cultivar exposed to one pathogen population produced very different levels of disease depending on where on the slope the plants were growing. If the cultivar was assessed for leaf blast susceptibility only in the valley bottom it would have been declared resistant to leaf blast, and if only at the top of the slope, highly susceptible. A large-scale manifestation of this phenomenon occurred in the Tamale region of northern Ghana in the early 1970s where severe leaf blast occurred in several thousand hectares sown with the improved rice cultivar IR20 which had been developed for use in irrigated rice in Asia. 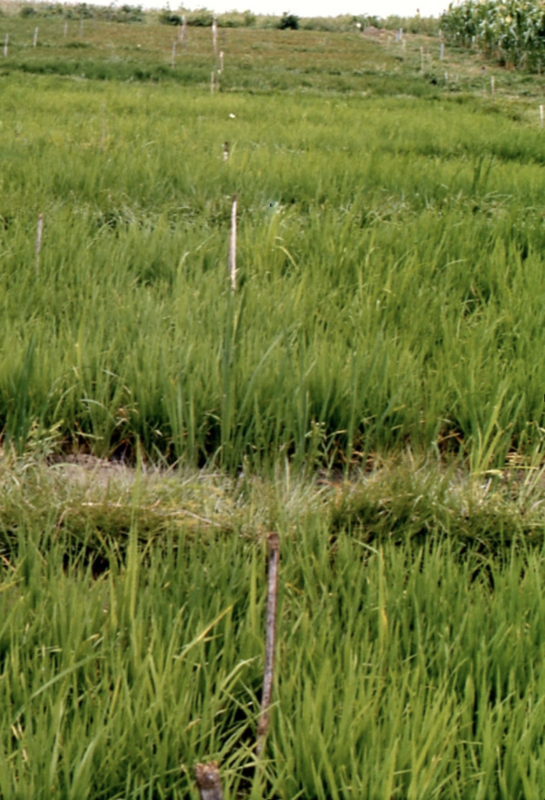 The rice in northern Ghana is rain-fed and can experience periods without standing water leading to drought stress which increases susceptibility to leaf blast. 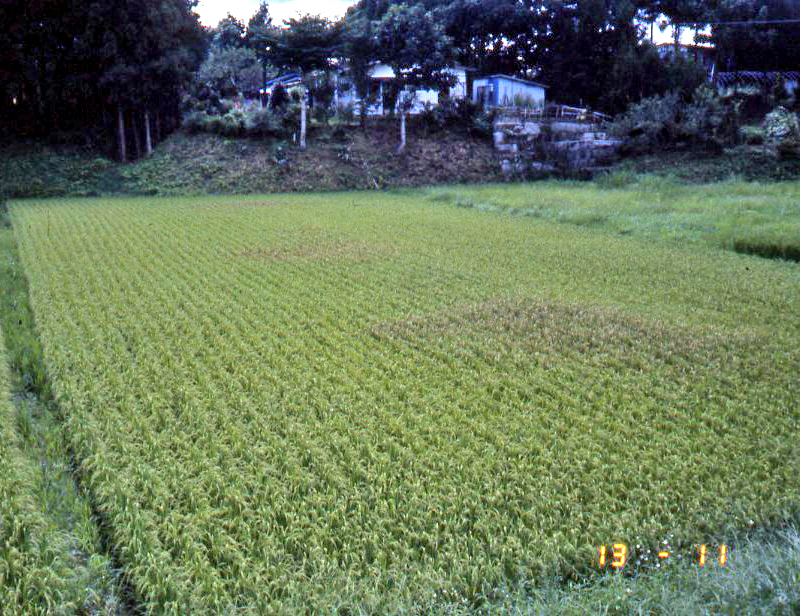 b) In small irrigated rice fields in Miyage Prefecture in northern Honshu, Japan, patches of severe neck blast were seen in areas of fields which were shaded by trees in the early morning (Figs 5 & 6). These areas of the fields probably had longer periods of duration of dew into the morning hours. At IITA, Ibadan, south-western Nigeria, cowpea plants occasionally were killed by wet- stem rot caused by Pythium aphanidermatum (Fig. 7). However, when benzimidazole (BZ) fungicides were used to control anthracnose and Cercospora leaf spots, the incidence of wet-stem rot increased significantly. Across six field trials the incidence of wet stem rot averaged 23.8 diseased plants per standard row in BZ fungicide treated plots, compared with 5.5 in untreated plots. The differences were highly significant (P = 0.001) in each trial (Williams R.J. & Ayanaba A., 1975. Phytopathology 65, 217-218). In this example we see the same cowpea genotype and the same pathogen population produced significantly different disease levels within a short distance in response to a specific environmental factor - the application of benzimidazole fungicides. 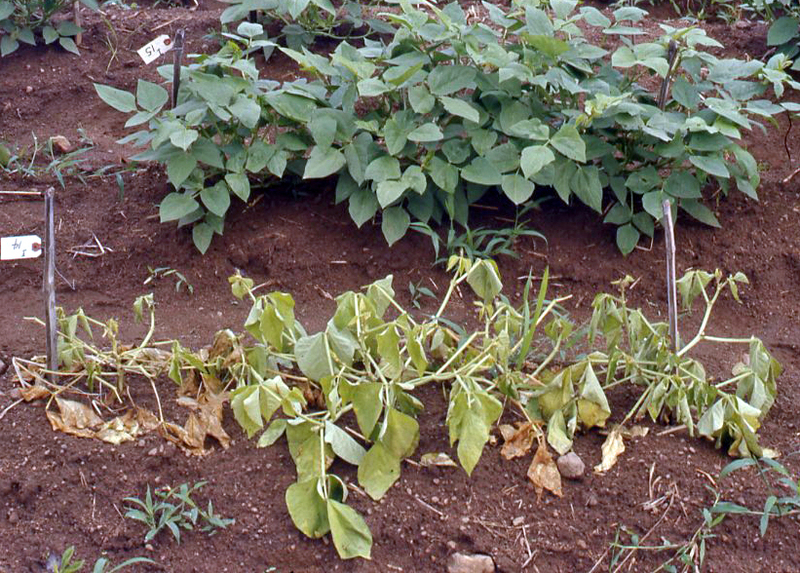 At IITA cowpeas occasionally were killed by Sclerotium stem rot caused by Sclerotium rolfsii (Fig. 8). 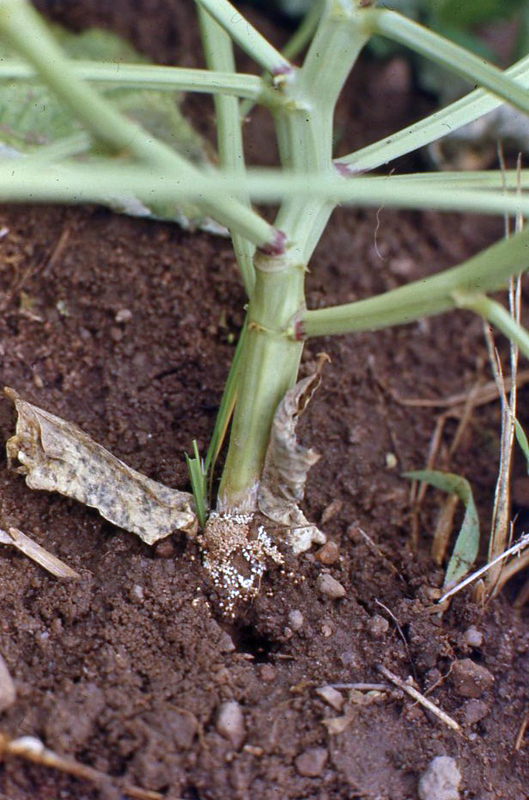 When rice straw was incorporated into the soil as a mulch, the incidence of cowpea Sclerotium stem rot increased to high levels with virtually all plants in mulched plots being killed (Fig. 9). Mulching the soil with rice straw probably enabled Sclerotium rolfsii to build up a much higher and more uniform inoculum level than in the non-mulched areas, leading to the situation where in the space of about one metre two rows of the same cowpea variety showed vastly different disease levels. Fig. 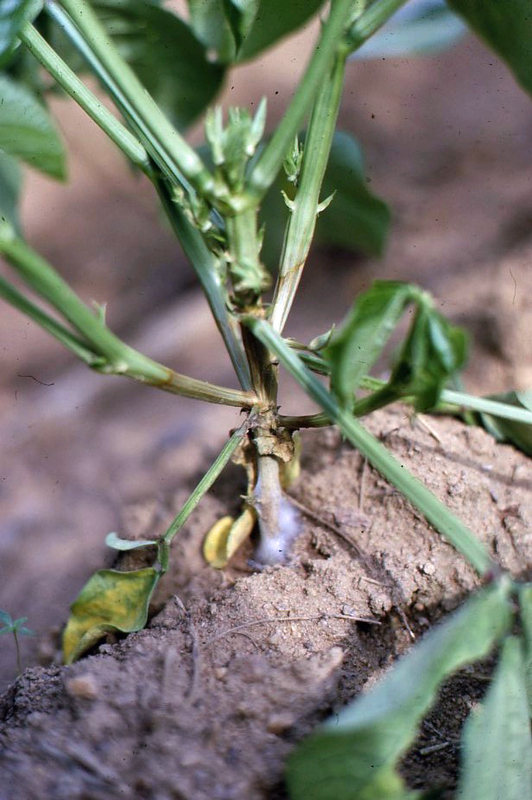 8 A cowpea plant showing symptoms of infection by Sclerotium rolfsii - the stem base is girdled and white sclerotia are visible around the diseased area which will rapidly lead to the death of the infected plant. Fig. 9 A row of cowpeas infected with Sclerotium rolfsii: infected plants are wilted and dying in the row in the foreground mulched with rice straw, in contrast to the disease-free plants of the same cultivar in the row behind which is not mulched. Again we see the same crop genotype and the same pathogen population producing vastly different disease severities within a short distance depending on the local environmental conditions. Soybeans sown at IITA in south-western Nigeria in March just before the start of the first rains often had very poor emergence whereas those sown at the start of the second rains at the beginning of September generally had no emergence problems. Soil temperatures were much higher in the March plantings. 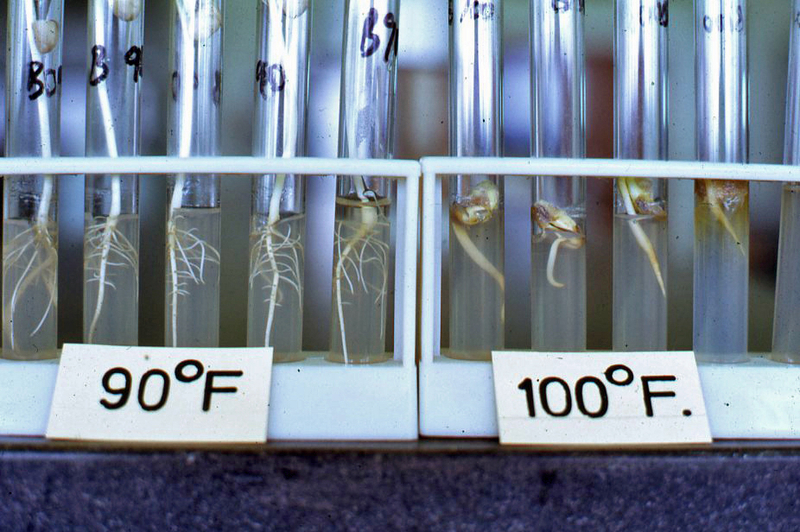 In controlled-temperature tests soybean seeds and young seedlings were engulfed by bacteria and failed to develop when grown at 100 F but developed normally at 90 F (Fig. 10). 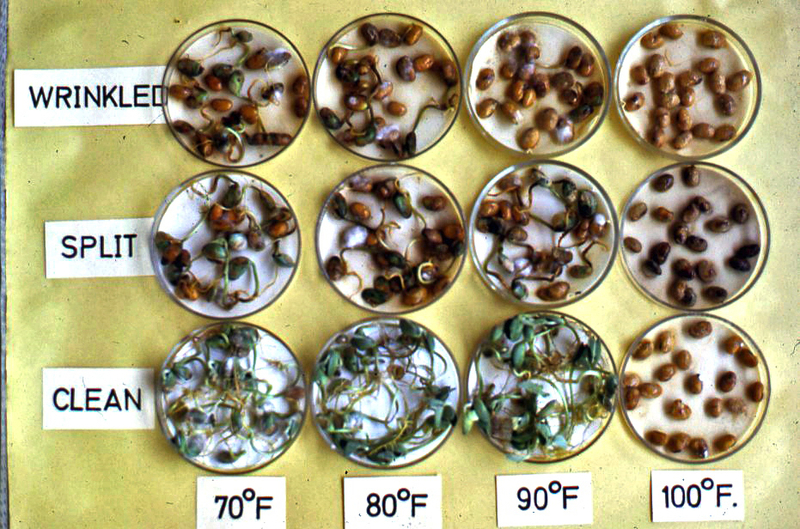 In other experiments, soybean seed type and temperature interacted to cause significant differences in seedling blight, with clean round seed germinating and developing healthily at 70, 80 and 90 F whereas wrinkled and split seed showed serious blight even at 70 F (Fig. 11). Fig. 11 Soybean seed of different visual categories from a single variety, showing seed-category x temperature interactions for seedling germination and development. 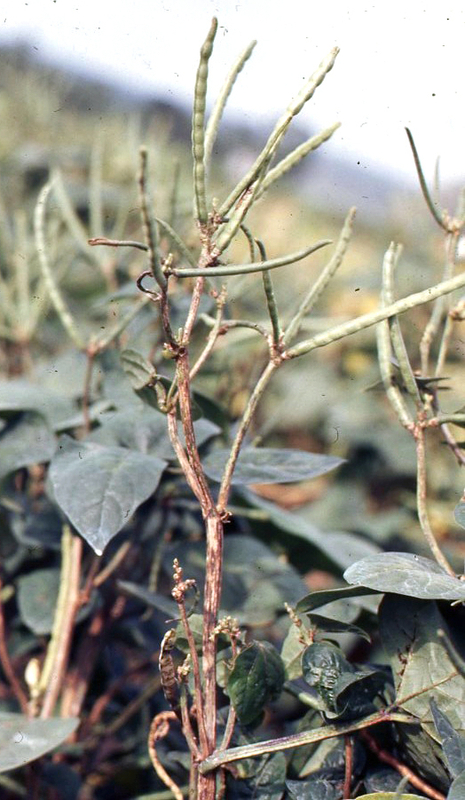 Cowpea anthracnose, caused by the fungus Colletotrichum lindemuthianum, is a potentially serious disease of cowpeas in south-western Nigeria. 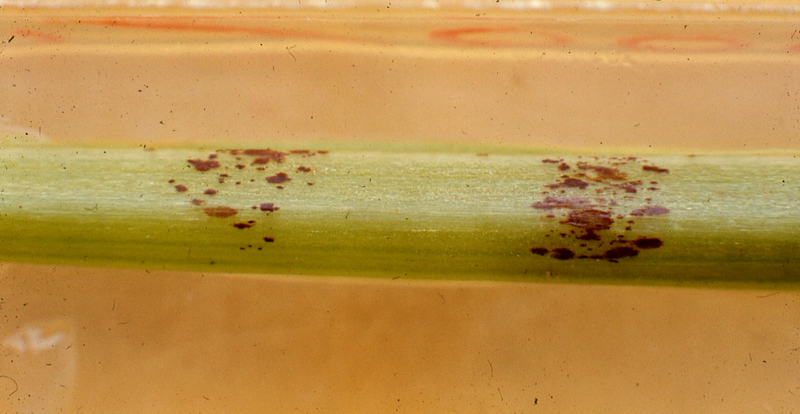 The pathogen can infect all above ground parts of susceptible plants, producing lesions which coalesce to form contiguous areas of sporulating tan-coloured diseased areas (Fig. 12). In field disease nurseries cowpea varieties varied significantly in susceptibility to anthracnose, from highly resistant varieties exhibiting tiny necrotic flecks which never developed into sporulating lesions to highly susceptible varieties in which most of the stems, petioles, leaf veins and peduncles were covered in sporulating lesions (Williams, R.J. 1977. Identification of multiple disease resistance in cowpea.Trop. Agric. (Trinidad), 54, (1), 53 - 59). An inoculation technique was developed using detached petioles (Fig.13) which offered controlled screening for anthracnose resistance, using standardised inoculum challenge and optimum environmental conditions for infection. 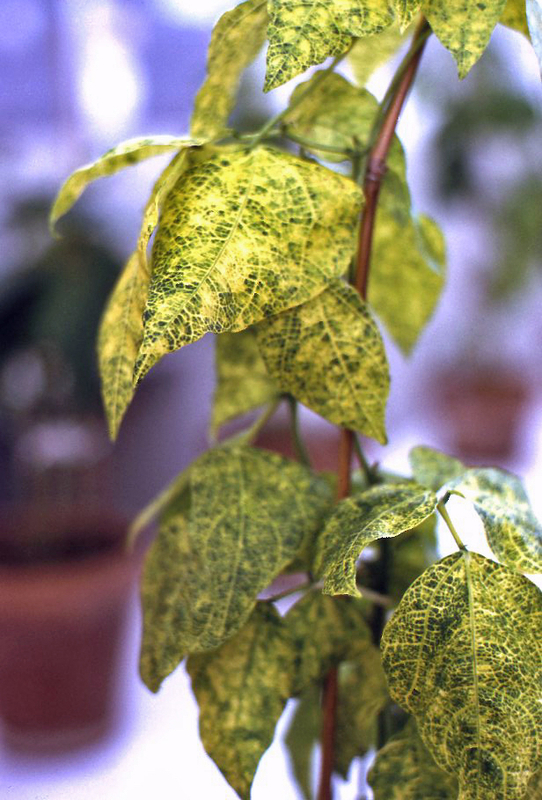 However, while highly susceptible varieties from field screening tests always developed large sporulating lesions in the detached petiole tests and most highly resistant varieties from field screening developed no more than slight flecking of the petioles at the inoculation site with no sporulation, there were varieties that had adequate resistance in the field but which showed up as highly susceptible in the detached petiole tests. While the resistance was adequate under field conditions, keeping the petioles at constant optimum conditions for infection and disease development proved too high a challenge. At IITA in south-western Nigeria the incidence of lima bean golden mosaic disease (Fig. 14), transmitted by the whitefly Bemisia tabaci, varied significantly depending on month of sowing. This effect of sowing date was consistent over years, with the April sown crop developing high levels of golden mosaic whereas the August sown crop always had much lower levels of the disease. In 1975, lima bean plots (15 rows of 10 m) were sown at the beginning of each month from April through August, with a thick barrier of maize planted around each plot. Golden mosaic incidence 50 days after sowing were: April sown 100%; May sown 86%; June sown 67%; July sown 22%; and August sown 13% (Williams, R.J. 1976, Plant Disease Reporter 60, 853 - 857). The reasons for this host-pathogen- (vector? )-environment interaction were never elucidated. Fig. 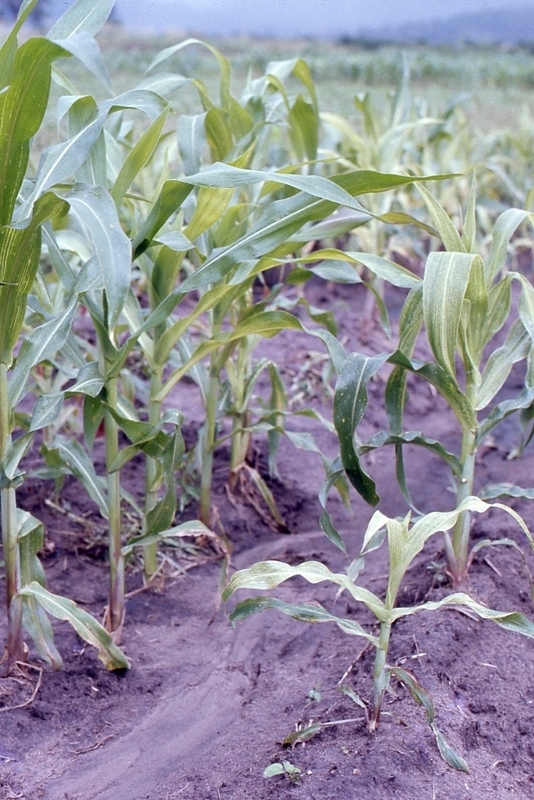 15 Two maize plants with typical symptoms of maize streak virus (right) alongside non-diseased plants; the plant in the foreground is stunted because of early infection, the plant behind it was infected later in its development. During the years 1970 to 1974 at IITA in south-western Nigeria the incidence of maize streak virus (Fig. 15), vectored by leaf hoppers in the Cicadulina genus, was much greater in September sowings than in March/April sowings (Rob Williams personal observations). The reasons for this variation were not elucidated but may have been related to environmental effects on the insect vector. What can be learnt from these examples? In all of these examples of crop-pathogen-environment interactions, incidence and severity of the disease in a crop varied significantly when a single crop genotype was exposed to a pathogen at one location in response to local variation in environmental factors. 4. 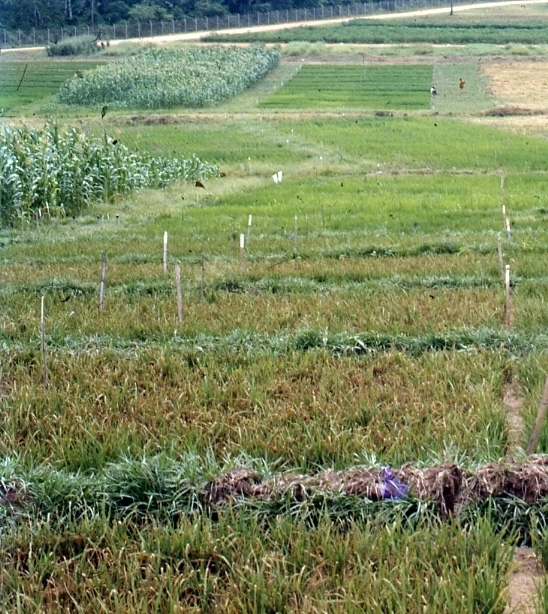 Multi-locational and multi-seasonal trials, through which new genotypes and agronomic practices are exposed to a range of environments and pathogen populations in a short time period, are essential if the strengths, weaknesses and suitability of new genotypes and agronomic practices are to be rigorously assessed.